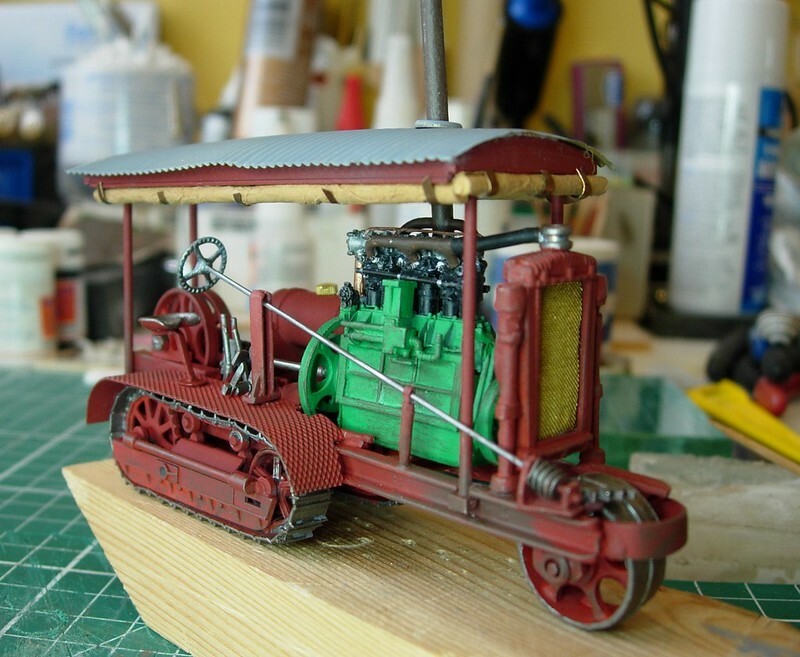 Freerails > Model Railroad Forums > Scratch-Building & Kitbashing > Tractors & Crawlers Anyone ? Tractors & Crawlers Anyone ? 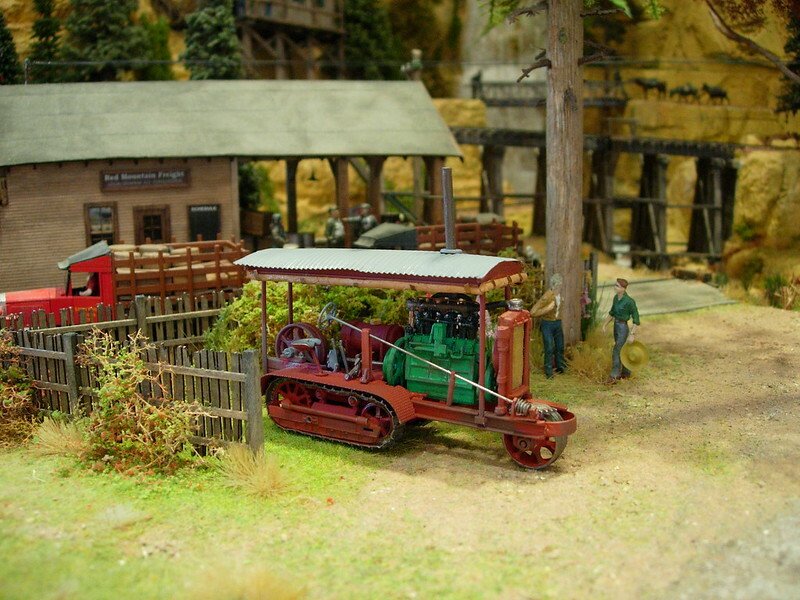 As there's been talk and pictures on Si's Mysterious Moose mountain thread http://www.freerails.com/view_topic.php?id=7318&forum_id=17&page=25 and Woodie's Silver City Narrow Gauge thread http://www.freerails.com/view_topic.php?id=6332&forum_id=17&page=64, I thought for the crack I'd start a Tractors and Crawlers thread to see what else is around. Not strictly railroad modelling but in the same scenic realm and it's to do with heavy haulage and they could be classed as critters! and my latest effort at a Holt. 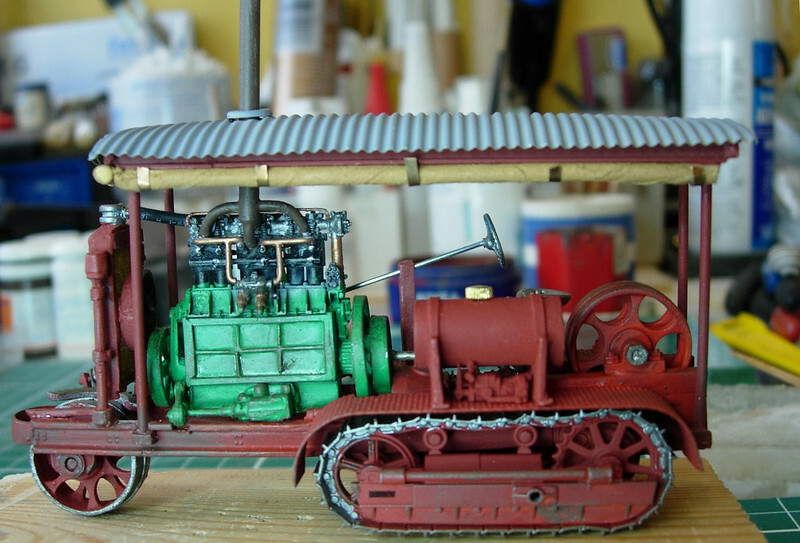 The first was made up from a Tamiya kit and one of those rather useful OO scale diesel engine mouldings used as wagon loads but the Holt was just based on the Tamiya tracks and cut down chassis. 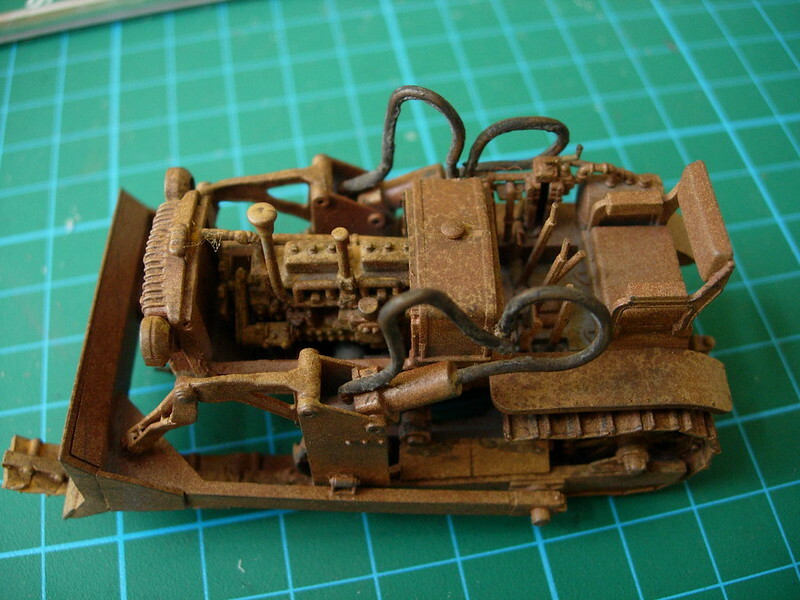 The Holt engine was made up from a 1/48 Taurus Mercedes D1 WW1 aero engine, scratch built from the base of the cylinders downwards with bits added from the bits box, a cheap (£7.50 including postage) toy tractor and the rest made up as I went along from styrene, etched tread plate and Crow River Products pulleys and sheaves. It's not supposed to be a copy, rather an "in the style of", so only offers a passing resemblance to the real thing but after a bit of tweaking it's now set for heavy hauling duties at Updah Creek - once it finds a driver that is!. Please add yours and how you built them. AWESOME work on the Holt ! Those crazy Updah loggers sure like to guzzle gas ! 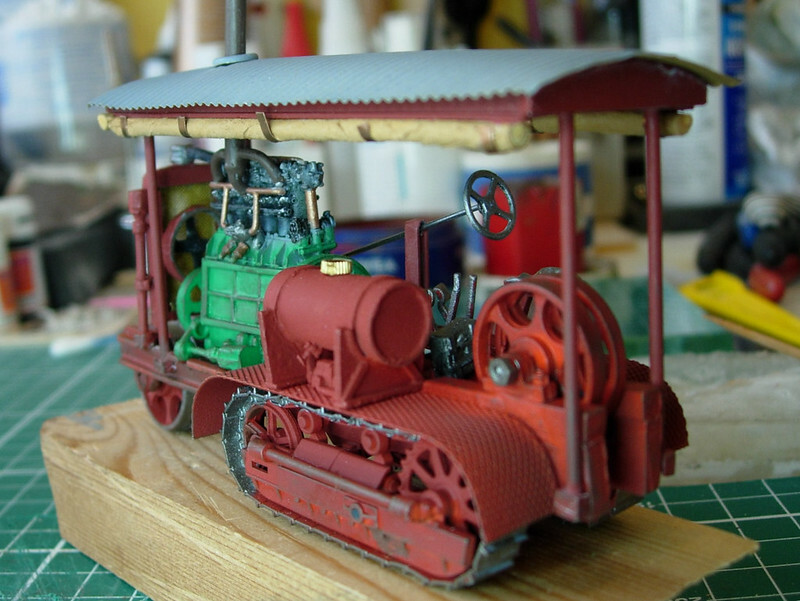 Cool re-use of the Tamiya track parts. I did write off 1:35 tanks at one time, as not suitable for mining railroad operations. ...built on an old SHERMAN TANK chassis from WWII !! There IS ! a prototype for EVERYTHING and Freerails has a few of 'em ! I can't offer much in the way of pix. at the moment Doug. Other than Dozey Dmitry ( thanks ! ) & his 'faux TEN' again. ...but couldn't resist a new arrival recently, for 'experimental purposes' ! That's very reminiscent of the Tamiya Komatsu, big tractor, tiny driver. Were the vehicles really that big - I suppose they could have been! Sherman tank based - now that is going to be off the wall! The Blaw Knox is a 'Dinky Supertoys' die-cast from the swingin' '60s ! The driver dude is kinda supposed to be O-scale (ish). If however you sit Dozey Dmitry at the controls, it looks pretty OK. 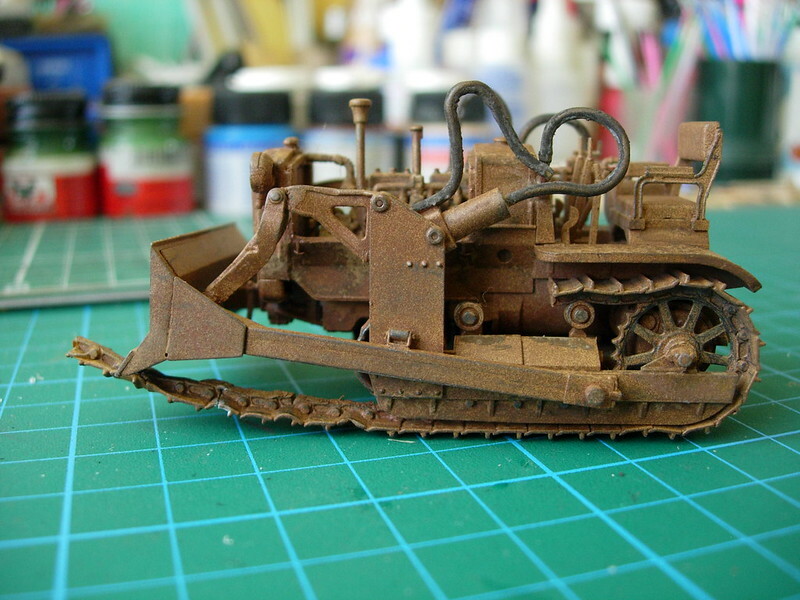 It is a big dozer though, but in fact very much the same size as a 1:35 Caterpillar D7. 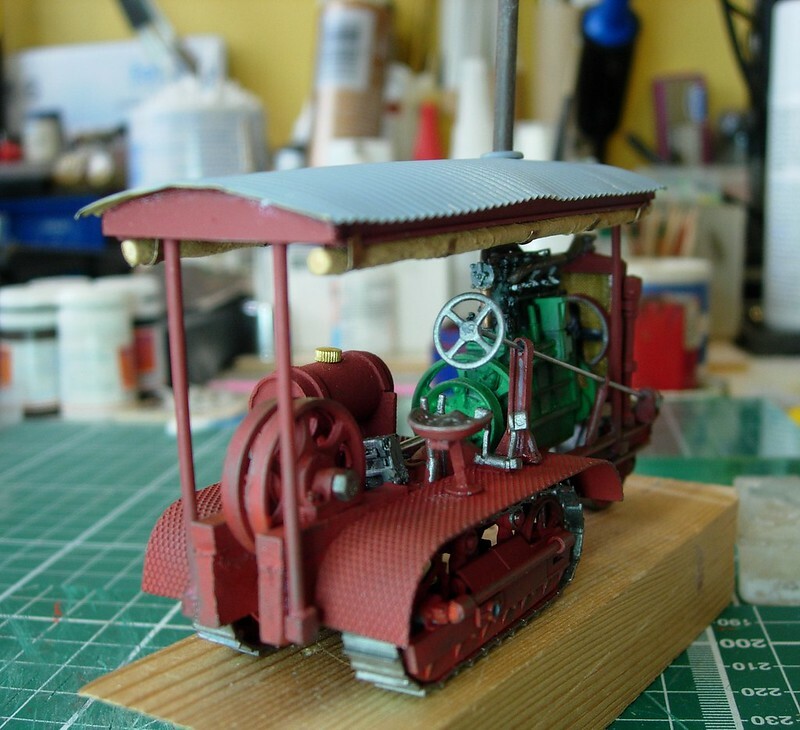 I have an Airfix London Omnibus driver testing at the moment for chief tractor op. Just what you need to clear the traffic in Central London !! ... Why did you have to remind me of THAT ! I might just have to try & score a Tamiya on evilBay now. Heaven help me ... TOO many kits . . . There is with "in the style of" a certain point where the mind fills in the details enough to consider the thing to be a case of 'it is'. Thanks Forrest and I love your signature, very much after my own methods. I don't think I've ever built a true copy - nor am I capable! I did look at a Sherman tank ! 19'2" - 20'7" long, depending on type, and 8'7" - 9'10" wide. 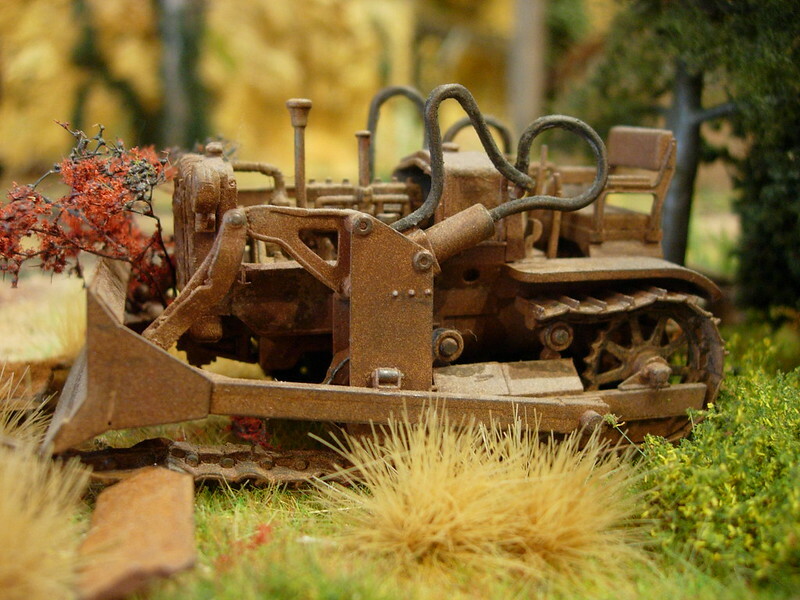 The logging monster on the Sherman chassis is on my other 'puter, so can't Post a pic. right now. Looking at the Sherman & the smaller Stuart tanks, they do seem to have similar track & drive wheels. To my untrained eye, the big difference being the Sherman has 3 double-wheel bogies + a big wheel at each end of the track. The smaller Stuart only 2 double-wheel bogies + a big wheel at each end of the track. The Stuart is 15' long and 7'6" wide. The tracks & bogies would make interesting running-gear for a logging/mining lash-up. ...but I believe possibly that the design was quite clever, in that it did allow disassembly & repair, even in the field, whereas a lot of tanks were simply 'monolithic'. The Stuart could make a nice compact (ish) base for a 'theres a prototype for everything', something. Of course there are numerous military 'half tracks' that could be worth investigating as well. For the Holt Doug, it looks real nice in the scene on the layout ! Thanks for the kind words Si and more distant positioning does cover up a multitude of sins compared to cruel close-ups! As for Shermans, Stuarts et al, I reckon you could find a prototype for virtually anything with enough digging so whichever track and drive set up floats your boat is the way to go. For me that was the first decision and the rest just followed on from there. P.S. I was hoping lots of others would show their wares but it looks like everybody's a bit shy at the moment! Well I'll put Dozey Dmitry (so far) up again here, since he's dozed off in another thread somewhere. 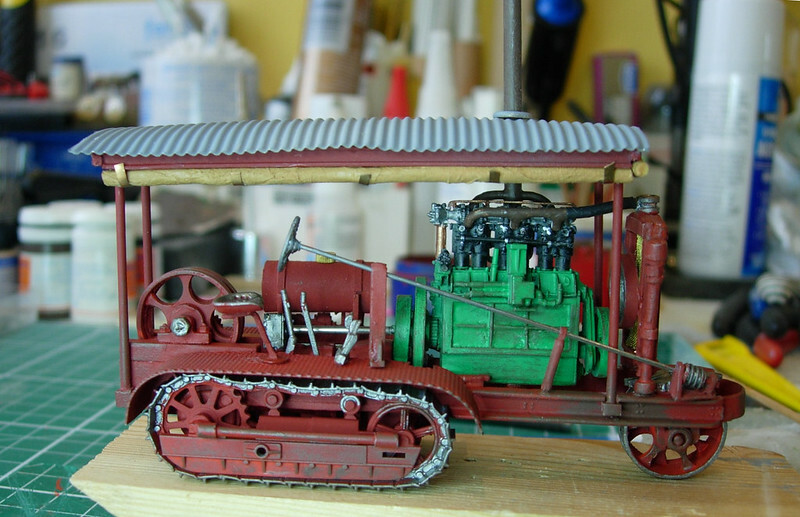 Perhaps Woodie will Post his cool Tamiya mod. machine here again as well. Or maybe Cor with his weathered I.H.24 (I think). Neat, but wouldn't the hoses have rotted away after so long?